In consideration of the high-temperature characteristic of engine’s waste heat and stricter environmental regulations, natural substance, including CO2 and hydrocarbons, have been treated as promising working fluid for diesel engine waste heat recovery due to its environment friendly and excellent physical and chemical properties. 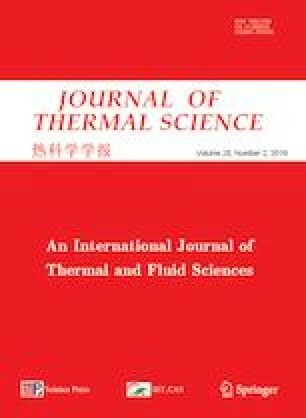 This paper presented a comprehensive performance analysis on transcritical Rankine cycles for diesel engine multiple waste heat recovery using hydrocarbons and CO2 as working fluid. The optimal turbine inlet pressures corresponding to maximum net power output, maximum exergy efficiency and minimum electricity production cost (EPC) were obtained. The effect of working fluid on these optimal pressures has been discussed. For fluids with low critical temperature, the optimal pressure corresponding to maximum net power output is lower than the one for maximum exergy efficiency, while the opposite results can be found for fluid with high critical temperature. Then, the effect of various working fluid properties in transcritical cycle performance is discussed. Comparison results show that CO2 obtains only more power output than Ethane, Propane and Propene, but CO2 is capable of absorbing more energy from engine coolant and regeneration heat with comparable total heat transfer areas and has an advantage in turbine size, particularly for hydrocarbons with high critical temperature. The authors would like to acknowledge the National Key Research and Development Plan of China (2017YFE0102800) and the National Natural Science Foundation of China (No. 51676133) for grants and supports. Nelson C., Exhaust energy recovery-2008 Semi-Mega Merit Review. Cumins, DEER Conference. 2008. https://doi.org/www.energy.gov/sites/prod/files/2014/03/f11/merit08_nelson.pdf. Persichilli M., Held T., Hostler S., Zdankiewicz E., Klapp D., Transforming waste heat to power through development of a CO2-based-power cycle. Electric Power Expo, 2011. https://doi.org/www.echogen.com/_CE/pagecontent/Documents/Papers/ECHOGEN-ElectricPowerExpo2011.pdf.